The Amazing Heresies of Antipope Paul VI Exposed Download & Watch all the DVDs & Videos for free by clicking here! 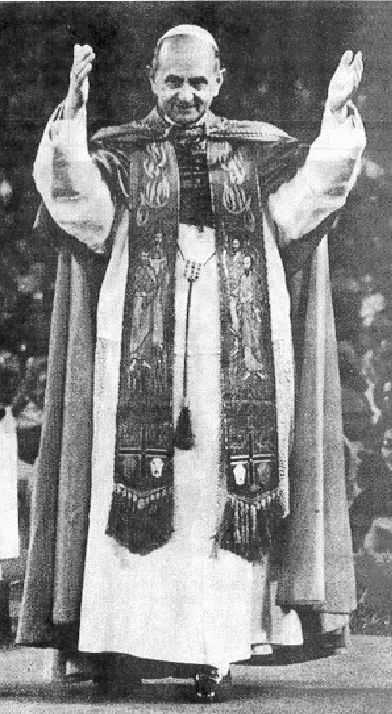 It’s important to keep in mind that Paul VI was the one who gave the world the New Mass, the other new “sacraments,” and the heretical teachings of Vatican II. If you go to the New Mass or embrace the teachings of Vatican II, the confidence that you have that these things are legitimate is directly connected to the confidence that you have that Paul VI was a true Catholic pope. 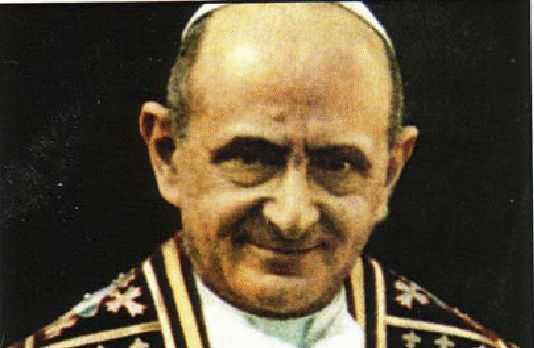 We will now expose the amazing heresies of Paul VI. We will show, from his official speeches and writings, that Paul VI was a complete apostate who was not even remotely Catholic. All of the official speeches and writings of the men who claim to be pope are contained in the Vatican’s weekly newspaper, L’ Osservatore Romano. The Vatican has reprinted issues of their newspaper from April 4, 1968 to the present. From those speeches, we will now prove that Paul VI was not a true pope because of the irrefutable and undeniable evidence that he was a complete heretic and an apostate. 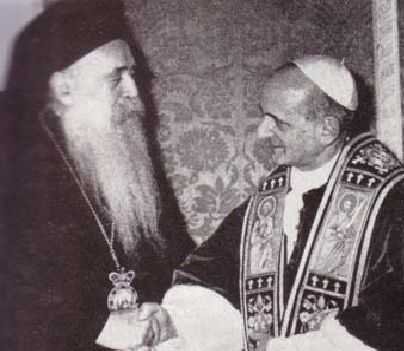 Here we see Paul VI giving a clear Masonic handshake to the Eastern Schismatic Patriarch of Constantinople, Athenagoras, on Jan. 5, 1964. The two also mutually lifted the reciprocal excommunications of 1054. Translation: this means that Paul VI considered that the Eastern "Orthodox" are no longer excommunicated even though they deny the Papacy. Therefore, according to him, the Papacy is not a dogma binding under pain of excommunication. 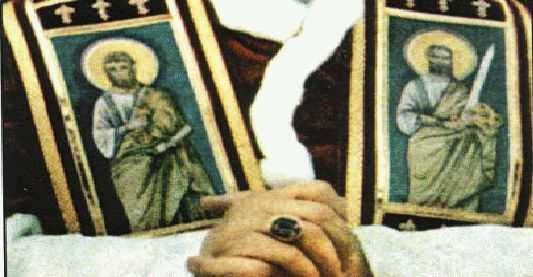 This means that the schismatic Church is the Church of Christ according to antipope Paul VI. Here Paul VI reveals that the Vatican II agenda with regard to Protestant sects has gone from polemical opposition – in other words, an opposition to their false doctrines – to an attitude of mutual respect for, their false religion. Paul VI's disastrous influence was visible immediately. For example, in Holland not a single candidate applied for admission to the priesthood in 1970, and within 12 months every seminary there was closed.116 Spiritual destruction was everywhere; countless millions left the Church; countless others ceased practicing their Faith and confessing their sins. Catholics must have no part with Antipope Paul VI’s New Mass (the Novus Ordo) and must completely reject Vatican II and the new sacramental rites. Catholics must completely reject Antipope Paul VI for the non-Catholic antipope he was. Catholics must reject and not support any group which accepts this apostate as a valid pope, or which accepts the New Mass or Vatican II or the new sacramental rites of Paul VI and stay away from all masses of heretical priests, whether valid or nonvalid. 1 Declaration of Archbishop Marcel Lefebvre, August, 1976; partially quoted by Bishop Tissier De Mallerais, The Biography of Marcel Lefebvre, Kansas City, MO: Angelus Press, 2004, p. 505. 2 L’Osservatore Romano (the Vatican’s Newspaper), Dec. 14, 1972, p. 1. 3 L’Osservatore Romano, July 5, 1973, p. 1. 4 The Papal Encyclicals, by Claudia Carlen, Raleigh: The Pierian Press, 1990, Vol. 3 (1903-1939), p. 82. 5 The Papal Encyclicals, Vol. 1 (1740-1878), p. 230. 6 L’Osservatore Romano, Nov. 16, 1972, p. 1. 7 The Papal Encyclicals, Vol. 3 (1903-1939), pp. 313-314. 8 L’Osservatore Romano, Oct. 11, 1973, p. 10. 9 L’Osservatore Romano, Jan. 20, 1972, p. 1. 10 L’Osservatore Romano, Dec. 22, 1977, p. 2. 11 L’Osservatore Romano, Dec. 18, 1969, p. 2. 12 L’Osservatore Romano, Dec. 17, 1970, p. 7. 13 L’Osservatore Romano, July 14, 1977, p. 12. 14 L’Osservatore Romano, Oct. 9, 1969, p. 5. 15 L’Osservatore Romano, Dec. 25, 1975, p. 5. 16 L’Osservatore Romano, Sept. 12, 1974, p. 2. 17 L’Osservatore Romano, Oct. 10, 1974, p. 7. 18 The Papal Encyclicals, Vol. 1 (1740-1878), p. 238. 19 L’Osservatore Romano, Oct. 11, 1973, p. 4. 20 L’Osservatore Romano, Aug. 14, 1969, p. 12. 21 L’Osservatore Romano, March 11, 1976, p. 12. 22 L’Osservatore Romano, Sept. 13, 1973, p. 8. 23 L’Osservatore Romano, Nov. 1, 1973, p. 1. 24 L’Osservatore Romano, Jan. 30, 1975, p. 5. 25 L’Osservatore Romano, June 15, 1972, p. 5. 26 L’Osservatore Romano, June 23, 1977, p. 5. 27 L’Osservatore Romano, June 21, 1973, p. 5. 28 L’Osservatore Romano, Sept. 21, 1972, p. 2. 29 L’Osservatore Romano, Oct. 2, 1969, p. 2. 30 L’Osservatore Romano, June 24, 1976, p. 4. 31 L’Osservatore Romano, Dec. 22, 1977, p. 2. 32 L’Osservatore Romano, Aug. 14, 1969, p. 10. 33 L’Osservatore Romano, Aug. 7, 1969, p. 1. 35 Decrees of the Ecumenical Councils, Vol. 1, pp. 550-553; Denzinger, The Sources of Catholic Dogma, B. Herder Book. Co., Thirtieth Edition, 1957, no. 39-40. 36 L’Osservatore Romano, July 17, 1969, p. 1. 37 L’Osservatore Romano, Dec. 20, 1973, p. 3. 38 L’Osservatore Romano, Aug. 14, 1975, p. 3. 39 L’Osservatore Romano, April 23, 1970, p. 12. 40 L’Osservatore Romano, Feb. 10, 1972, p. 3. 41 L’Osservatore Romano, Jan. 27, 1972, p. 12. 42 L’Osservatore Romano, July 14, 1977, p. 10. 43 L’Osservatore Romano, Jan. 28, 1971, p. 1. 44 L’Osservatore Romano, July 13, 1972, p. 12. 45 L’Osservatore Romano, June 6, 1968, p. 5. 46 L’Osservatore Romano, Nov. 4, 1971, p. 14. 47 L’Osservatore Romano, July 27, 1972, p. 12. 48 L’Osservatore Romano, Jan. 1, 1976, p. 6. 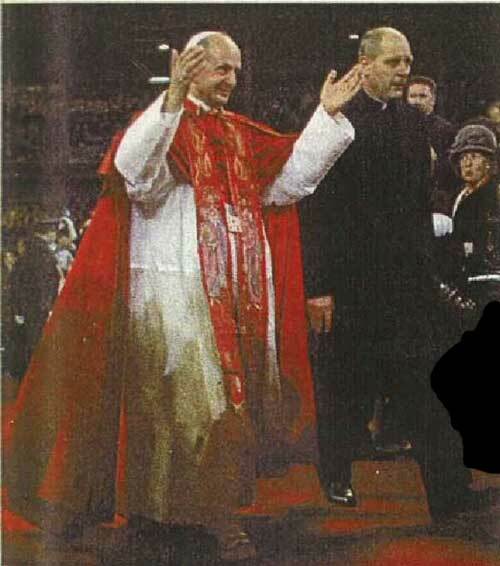 49 L’Osservatore Romano, March 18, 1971, p. 12. 50 The Papal Encyclicals, Vol. 1 (1740-1878), p. 230. 51 L’Osservatore Romano, Dec. 30, 1976, p. 8. 52 L’Osservatore Romano, Feb. 1, 1973, p. 12. 53 L’Osservatore Romano, May 11, 1972, p. 4. 54 L’Osservatore Romano, June 6, 1968, p. 4. 55 L’Osservatore Romano, July 13, 1978, p. 3. 56 L’Osservatore Romano, Dec. 15, 1977, p. 4. 57 L’Osservatore Romano, July 13, 1972, p. 12. 58 L’Osservatore Romano, May 24, 1973, p. 6. 59 L’Osservatore Romano, Jan. 21, 1971, p. 12. 60 L’Osservatore Romano, June 19, 1969, p. 9. 61 L’Osservatore Romano, Feb. 8, 1973, p. 7. 62 L’Osservatore Romano, Sept. 6, 1973, p. 8. 63 L’Osservatore Romano, Dec. 26, 1968, p. 4. 65 L’Osservatore Romano, May 5, 1977, p. 1. 66 L’Osservatore Romano, Aug. 14, 1969, p. 1. 67 L’Osservatore Romano, April 18, 1968, p. 2. 68 The Papal Encyclicals, Vol. 1 (1740-1878), p. 229. 69 L’Osservatore Romano, Nov. 26, 1970, p. 7. 70 L’Osservatore Romano, Sept. 5, 1968, p. 10. 71 The Papal Encyclicals, Vol. 5 (1858-1981), p. 227. 72 World Net Daily, Feb. 5, 2000. 73 L’Osservatore Romano, Feb. 17, 1972, p. 5. 74 L’Osservatore Romano, May 2, 1968, p. 4. 75 L’Osservatore Romano, July 21, 1977, p. 6. 76 L’Osservatore Romano, Oct. 15, 1970, p. 3. 77 L’Osservatore Romano, June 17, 1976, p. 3. 78 L’Osservatore Romano, Sept. 22, 1977, p. 11. 79 L’Osservatore Romano, June 15, 1978, p. 3. 80 L’Osservatore Romano, Feb. 11, 1971, p. 12. 81 L’Osservatore Romano, Aug. 14, 1969, p. 8. 82 L’Osservatore Romano, May 27, 1971, p. 5. 83 L’Osservatore Romano, Dec. 2, 1971, p. 3. 84 L’Osservatore Romano, Jan. 20, 1972, p. 7. 85 L’Osservatore Romano, April 19, 1973, p. 9. 86 L’Osservatore Romano, Feb. 7, 1974, p. 6. 87 L’Osservatore Romano, Feb. 28, 1974, p. 3. 88 L’Osservatore Romano, Jan. 2, 1969, p. 12. 89 L’Osservatore Romano, May 8, 1969, p. 3. 90 L’Osservatore Romano, July 24, 1969, p. 12. 91 L’Osservatore Romano, Aug. 5, 1971, p. 12. 92 L’Osservatore Romano, Sept. 12, 1968, p. 1. 93 L’Osservatore Romano, July 24, 1975, p. 2. 94 L’Osservatore Romano, Oct. 7, 1976, p. 2. 95 L’Osservatore Romano, Oct. 28, 1976, p. 4. 96 L’Osservatore Romano, Dec. 16, 1976, p. 4. 97 L’Osservatore Romano, Dec. 30, 1976, p. 1. 98 L’Osservatore Romano, June 19, 1969, p. 6. 99 L’Osservatore Romano, Dec. 25, 1969, p. 3. 100 L’Osservatore Romano, Jan. 1, 1976, p. 11. 101 L’Osservatore Romano, Dec. 30, 1976, p. 1. 102 The Oxford Illustrated Dictionary, p. 425. 103 L’Osservatore Romano, Dec. 30, 1976, p. 5. 104 L’Osservatore Romano, Sept. 24, 1970, p. 2. 105 The Papal Encyclicals, Vol. 3 (1903-1939), p. 6. 106 Fr. Joaquin Arriaga, The New Montinian Church, pp. 394-395. 107 L’Osservatore Romano, Dec. 3, 1970, p. 10. 108 George Weigel, Witness to Hope, p. 238. 109 The Reign of Mary, Vol. XXVI, No. 81, p. 17. 110 Mark Fellows, Fatima in Twilight, Niagra Falls, NY: Marmion Publications, 2003, p. 193. 111 Mark Fellows, Fatima in Twilight, p. 193. 112 Mark Fellows, Fatima in Twilight, p. 206. 113 Nino Lo Bello, The Incredible Book of Vatican Facts and Papal Curiosities, Ligouri, MO: Liguori Pub., 1998, p. 195. 114 The Reign of Mary, Vol. XXVIII, No. 90, p. 8. 115 George Weigel, Witness to Hope, New York, NY: Harper Collins Publishers, Inc., 1999, p. 328. 116 Piers Compton, The Broken Cross, Cranbrook, Western Australia: Veritas Pub. Co. Ptd Ltd, 1984, p. 138. 117 L’Osservatore Romano, July. 13, 1972, p. 6. 118 Jean Guitton, “Nel segno dei Dodici,” interview by Maurizio Blondet, Avvenire, Oct. 11, 1992. 119 L’Osservatore Romano, Dec. 19, 1968, p. 3. 120 The Oxford Illustrated Dictionary, Second Edition, p. 512. 121 L’Osservatore Romano, Nov. 23, 1972, p. 1. 122 L’Osservatore Romano, Jan. 7, 1971, p. 1. 123 L’Osservatore Romano, Sept. 26, 1974, p. 6. 124 L’Osservatore Romano, May 22, 1975, p. 3. 125 L’Osservatore Romano, May 18, 1969, p. 12. 126 L’Osservatore Romano, March 9, 1972, p. 2. 127 L’Osservatore Romano, July 12, 1973, p. 6. 128 L’Osservatore Romano, Oct. 9, 1969, p. 1. 129 Fr. Joaquin Arriaga, The New Montinian Church, p. 391.